Shopcade is a new Facebook application, which allows users to shop and then share their recommendations among their networks. The Shopcade model certainly makes sense, a recent study by YouGov found that more than half of UK social media users aged between the ages of 18 and 54 are influenced by their friends and family online before they make a purchasing decision. Ahh we’re such sheep, aren’t we?! So based on the fact we’re heavily influenced by our online networks, Shopcade allows users to browse more than 40 million products and then create their own personalised Shopcades full of product recommendations. Users can then browse recommendations, see what their friends like, view recent trends and then buy what they like the look of. But wait, Shopcade isn’t just about helping people out and being nice and considerate out of the goodness of your heart, if your friends buy the items you’ve recommended, you’ll get a percentage of the sale. Sure this gives people an incentive to use Shopcade and I’m sure most people wouldn’t mind that their mate gets a bit of cash if they genuinely want the product. But, we worry that adding commission into the scheme could make people spam their friends, recommend a lot of things they don’t care about or just be a general nuisance. Whether people use Shopcade for good or just try to bully their friends into buying products, it’s a very interesting model, which combines online shopping and social media in a way that puts normal customers at the core. Just remember to use it nicely, otherwise even your nearest and dearest will be forced to unfriend. Hi BeccaThanks very much for your article and your fair review of Shopcade. 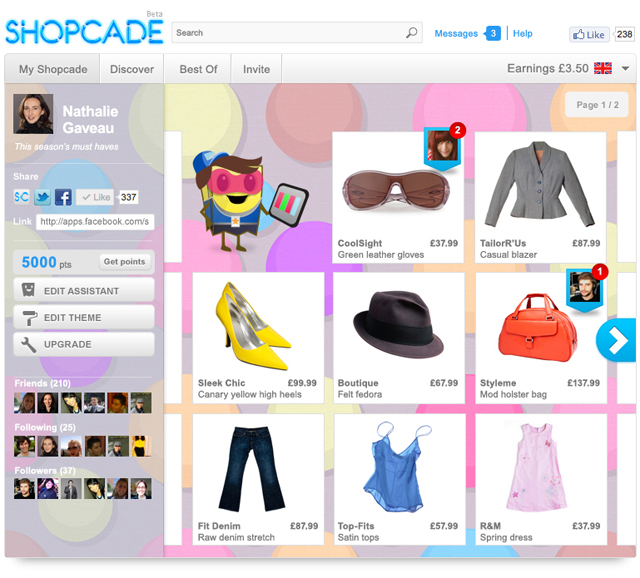 -As you know, Shopcade rewards users per transaction, not per click. Therefore, users don't gain anything from “spamming” their friends because they will only be rewarded when their friend actually makes a purchase. As a result, our users are encouraged to suggest products that they feel are most relevant for users – and this is what we are seeing not he platform, as we have not had any issues with spam to date. -In addition, users are making suggestions to their Facebook friends and users can follow/unfollow whoever they please. Therefore, spammy users are unlikely to have many followers. It's true that users may every now and then post products that are less interesting for their followers but I don't think this can be qualified as spam.